Logan Intl. - Punta Cana Intl. Liberty Intl. - Punta Cana Intl. Christopher Columbus first set foot on the island of Hispaniola in the year 1492, and now it’s your turn to follow the same path. 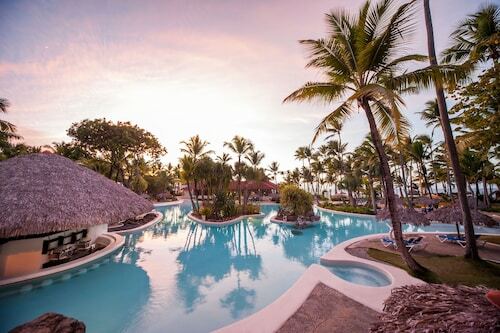 Punta Cana vacations are the perfect Caribbean getaway, where you can snorkel, drink mama juana, and relax in a palm-tree hammock. 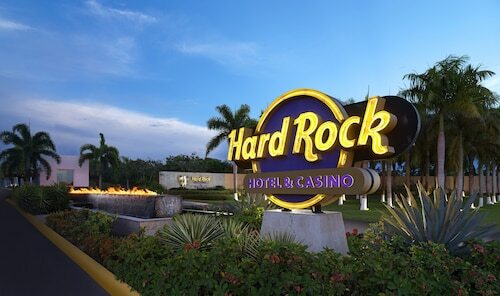 After you book your Punta Cana vacation package, be sure to look into all the activities and attractions in the area. Ever wondered what it would be like to have a dolphin as a best friend? Find out by swimming with one at the Dolphin Discovery Punta Cana. After you’re done bonding with Flipper, get over to Scape Park for some serious outdoor adventures. Take a zipline tour through the jungle canopy, or go spelunking in Iguabonita Cave. Finally, cool off by taking a dip in the clearest blue water you have ever seen in the natural well of Hoyo Azul. 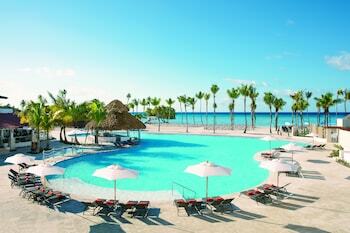 No matter what you end up doing, make sure you look into Punta Cana packages that feature all-inclusive options. Some bundle a variety activities with your deal! If you’re traveling in spring, make sure you’re in town on the first Monday of March for Punta Carnaval. The festival takes place in Puntacana Village, directly opposite from Punta Cana International Airport, so you’ll be able to go from your seat to party mode in about 15 minutes. Visiting during the summer? Get a cheap car rental in the airport and make the 120-mile drive to Santo Domingo for the Merengue Festival. A whole week of July is dedicated to music, dancing, food, and drinks. Feel the rhythm with the locals in true Dominican style. Does that sound like a beat you can follow? 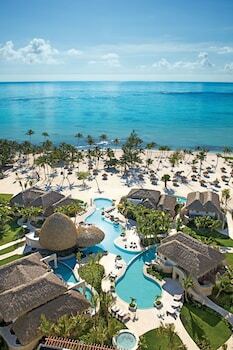 Search Travelocity’s Punta Cana hotel deals to find the one that suits you best. It’s time for you to leave your footprints in the sands of the Dominican Republic. 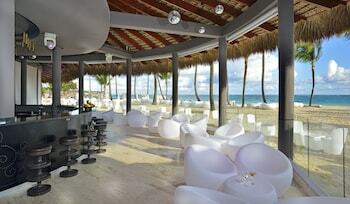 Need insider tips on must-see attractions in Punta Cana? 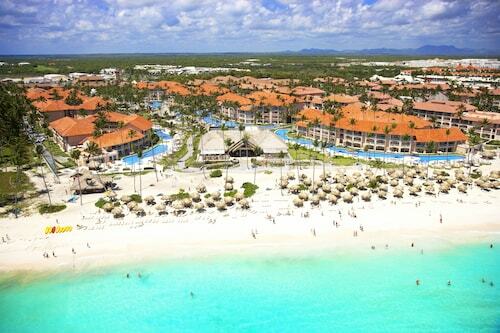 Check out our Punta Cana travel guide! The third-largest city in the Dominican Republic, La Romana is the perfect palm-lined representation of this Caribbean country; it is also surrounded by sugarcane fields—the region's major cash crop. 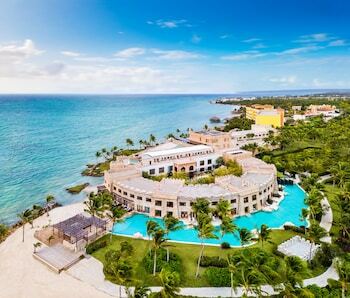 La Romana packages offer the opportunity to get a feel for everyday life in the Dominican Republic, while a hotel in La Romana serves as more than just a rest stop on the road between the capital and the Dominican's popular eastern beach resorts. The city's unique gastronomy and abundance of high-end golf courses draws tourists of all kinds to this bustling regional center. What currency is used in Punta Cana? The Dominican peso (DOP) is the official currency. However, most accommodations, restaurants, shops and excursion companies accept U.S. dollars (USD). 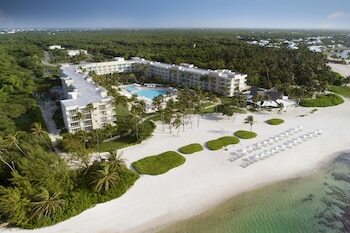 What is the best place to stay in Punta Cana? Bavaro is a popular tourist hub in the downtown area. With an excellent selection of resorts overlooking the sea, sun loungers lining white sand shores, restaurants galore and a lively nightlife, this is what beach vacation dreams are made of. 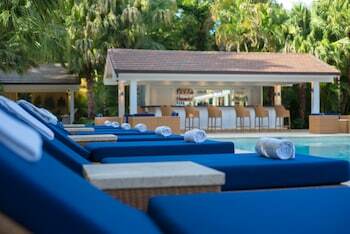 If you’re looking for a more upscale vibe, check out Cap Cana. About 7 miles from the center, this resort community offers numerous 5-star accommodations, although you will find cheaper options a few streets back from the action. 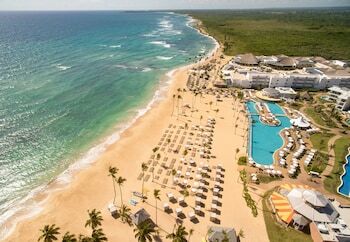 What is Punta Cana famous for? Dive into the deep blue waters of Hoyo Azul lagoon or perfect your swing at top golf courses like the Punta Espada. This Jack Nicklaus signature course hosts major tournaments like the PGA Champions Tour. Traveling with kids? Visit Manati Park (a theme park and zoo) or Dolphin Discovery to get close to some of the animals that call this sun-soaked paradise home. Located in Playa Bibijagua, this beachfront property is connected to the convention center and within a 5-minute walk of Bavaro Beach and Dolphin Island. Bavaro Lagoon and Palma Real Shopping Village are also within 2 mi (3 km). Nestled on the beach, this Punta Cana hotel is within 3 mi (5 km) of Cortecito Beach, Arena Gorda Beach, and Los Corales Beach. Palma Real Shopping Village is 2.8 mi (4.5 km) away. 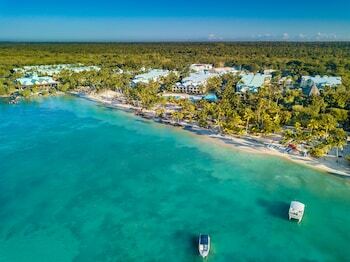 This All-inclusive resort is located on the shore of one of the Dominican Republic's most beautiful beaches, Bavaro-Punta Cana Beach, against the backdrop of the Caribbean Sea and 30 minutes from the airport. Situated in Punta Cana, this all-inclusive property is within 3 mi (5 km) of Cortecito Beach, Arena Gorda Beach, and Los Corales Beach. Palma Real Shopping Village is 2.6 mi (4.3 km) away.